So who is this crazed bomber, and what is he trying to stop with his explosions? Let’s find out after the credits! The team rushes to Seattle, where the terrorist has announced that he won’t stop bombing until they ‘get it under control’. He’s needlessly vague about just what ‘it’ is. In a bit of good news, just a couple of people were killed by the explosion, and the rest just got suffered minor burns and smoke inhalation. They also find the detonator, and start a search for anyone who might have seen the guy pressing it. Next they hold a press conference announcing they don’t know who detonated the bomb, hoping that this will convince the bomber to call them. Actually, you know what? 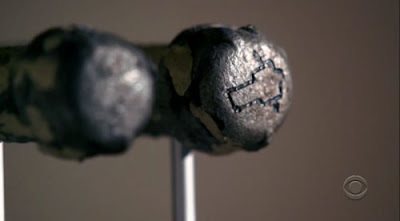 Take a look at the symbol before you read what they say it looks like. Okay, see that marking? What could it possibly be? Reid glances at it for just a second, and then makes an announcement, which turns out to be exactly right. A robot with an arrow through it. Yeah. I don’t see it either. When I saw it I thought ‘poorly-drawn key’. What did you think? Now that’s what a robot with an arrow in it looks like! The ream offers their profile, which boils down to ‘he’s a lot like the unabomber’. Then the bomber calls, and identifies himself as Allegro. 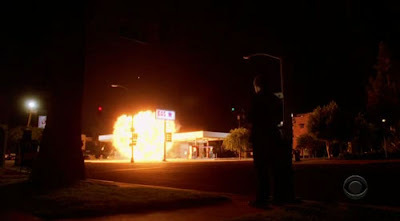 Then he blows up a gas station! 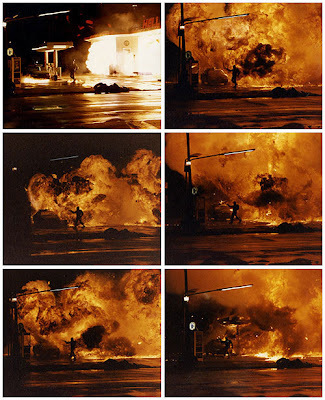 But it’s not as impressive as the gas station explosion from Robocop. Where was I? Oh, right. Criminal Minds. Sorry, I get carried away with Robocop sometimes. The team heads out to the newest explosion site and look for the manifesto that he announced that he was going to leave there. Flipping through it reveals that the bomber wants them to get rid of all technology immediately, or he’ll keep going up. So obviously he’s completely nuts. Reid remembers a helpful piece of information at this point (you’ll notice he does that a lot…), namely that ‘Allegro’ was the main character of a dystopian sci-fi novel from the 80s about a young boy who fights against the robots who have taken over the world! Which means that the bomber thinks he’s living out the book! 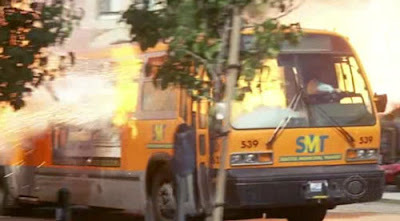 A more concrete lead comes when they notice that one of the people on the bus was a cutting edge computer scientist. After bringing him in they discover that not only is he the exact kind of person that the bomber wants to kill, but that he’s also a friend of the person who wrote the inspirational book! The writer’s name is Ursula Kent, and she also teaches in Seattle! What a happy coincidence… or is it? It’s not. Obviously the bomber is obsessed with the book, and has come to Seattle to stalk the author. For some reason the scientist refuses to accept the idea that he’s clearly the target of the bombing, and refuses FBI protection. He’s blown up something like six seconds later, getting out of his car on campus. We’ll later discover that the bomb worked by arming when you sat down on the seat, and detonating when you stood up again. But he blew up after driving back to the university from the FBI building – doesn’t that mean that the bomb would have had to have been planted inside the FBI’s parking garage? How on earth would the bomber have managed that? Somehow I doubt we’ll ever get an answer to that one. Other than bad writing, I mean. While decoy bombs start turning up all over the city Mandy and Reid head over to the university to interview the author. 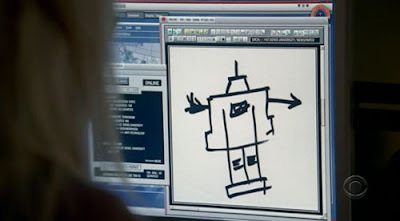 She doesn’t understand how her work could have inspired a killer, but she’s got a necklace in the shape of the robot with an arrow through it! She announces that she always wore it in class, meaning that the bomber must be one of her students, or at least someone who audited a class! She starts reading the manifesto, hoping to recognize the writing as belonging to one of her students. She doesn’t come up with a name right away, but she does let the team know about another pro-technology lecturer who lectures at her class every year. They’re able to get to the woman before she’s blown up, but not before sitting down in her car. This leads to one of those tense bomb-disarming sequences as the FBI tries to save her life. Rather ridiculously Derek elects to stay with the lecturer while she’s getting out of the car. Look, I know it’s heroic and all, but you staying by the car doesn’t change whether the bomb disposal was successful at all. Either they get it out safely, or they don’t. The only thing you accomplish by sticking around is to make it possible for the bomber to kill three people rather than two. Not really seeing the heroism there. Back at the uni the author claims she doesn’t recognize anything about the manifesto’s writing. Of course she’s lying, but it’s not immediately clear why. What is immediately clear is that the team is unbelievably stupid for leaving her alone at the office – the bomber has killed her two friends, and is basically stalking her. Just hang around the woman and eventually he’s going to turn up. Somehow this doesn’t occur to them until Reid goes over the plot of the book, which ends with the main character killing his mother. Gee, you don’t think that’s something you could have mentioned earlier? We’re rushing to the end now, so let’s move along. Bomber thinks that he’s author’s long-lost child that she gave up for adoption, and the book was a message to him. Author drops the bombshell that the child she gave up was a daughter. Whoops. The team tries to shoot him, but the author jumps into the bullet, feeling guilty about inspiring the whole killing spree. The episode ends without us discovering whether she dies from her injuries or not. 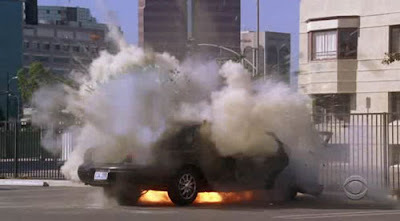 Also unrevealed – just how Allegro managed to plant a carbomb inside the FBI parking garage. They mentioned that they were going to check the surveillance tapes, and then hoped we’d forget about it. Just like that god-damned sniper. I’m gradually reaching the conclusion that in many fundamental ways this is not a well-written television show. Not particularly. The clue that cracked the case was Reid’s ability to remember the plot of a sci-fi novel he read as a child. None of their profiling of the suspect turned out to be accurate, nor did it help them catch the bomber. If one of the cops had read the novel, yes. 1/10 – It was yet another Criminal Minds special this week – showing them catching a serial bomber by having him not be a serial bomber at all. By now I’m used to the show copping out whenever they attempt to address a complex, difficult to solve crime – that’s kind of a given. What’s more puzzling to me is that this is the second time they’ve copped out in this specific way, by which I mean making it seem like they’ll have to track down a crazed bomber, only to have it turn out to be a guy with a specific, easy-to-quantify motive who just happens to use bombs as his weapon. Does this mean we can look forward to more not-snipers in the future? From the bombs to the anti-technology falderal, this was pretty clearly intended as CM’s Unabomber riff. And since the first episode of this show bragged about how the BSU profiled the Unabomber, let’s take a look at the real case, shall we? Ted Kaczynski was an incredibly intelligent man who attended Harvard at age 16, obtaining a degree in mathematics. During his time there he participated in a CIA-funded study that involved attempts to break him down psychologically, and he was so unhinged by these experiments that he would eventually toss aside his career, become a survivalist, and wage war against the technology that he believed was going to be used to completely control mankind. Anyhoo, the point is that he started trying to attack university officials and airlines by planting and mailing bombs, hence the name University and Airline BOMBER. You know, I had no idea where the name came from until I looked it up just now. The Mindhunter (John Douglas) profile correctly judged that the UNABOMBER would likely be a university graduate in science who had turned against technology. While this was fairly accurate, it was utterly useless in catching the guy for the 16 years after it was made. So how was he finally caught? Well it seems that Ted had a little brother named David, and David had a wife who always thought that Ted was really, really creepy. Seeing stories about the Unabomber in the news she’d told David that Ted was probably the guy, but he refused to believe her. It was only after the Unabomber manifesto was published and David recognized the writing as being suspiciously similar to some of Ted’s anti-technology screeds from the 70s that he finally came to agree with his wife’s instincts. So that’s how they caught the Unabomber. On Monday they had absolutely no idea who he was. On Tuesday a guy phoned up and told them who he was. On Wednesday he was arrested. Profiling, as usual, did not play a role. I would have said it was a spark plug. Final Destination 3: The Ghost of Murder on Ice!